Looking for a lighter dinner that isn’t bland and boring? This roasted Greek chicken with onions and peppers and homemade tzatziki is sure to please everyone in the family. You can eat it over a bed of lettuce or stuffed inside of pita bread. I like to roast the chicken, peppers and onions in the oven to get nice crispy charred edges, but you could also cook them in a skillet. 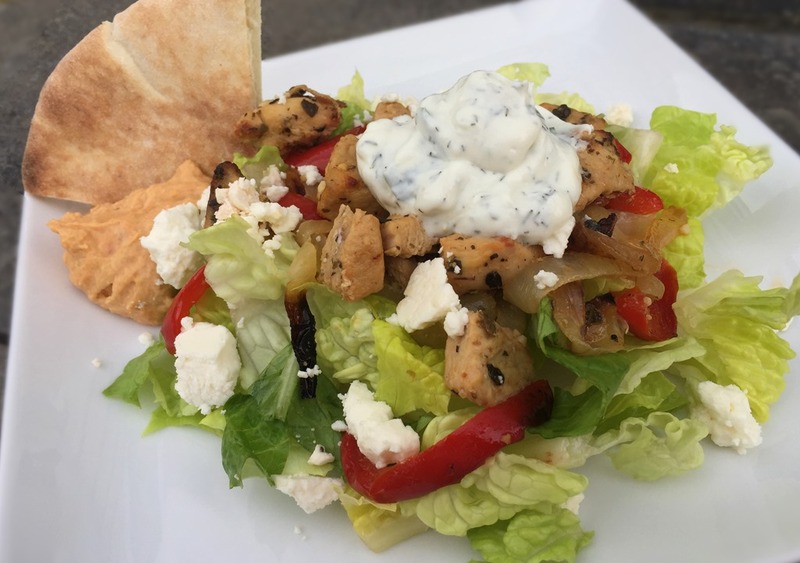 Homemade pita bread and hummus is great served with this salad. Instructions can be found HERE. Tzatziki is a garlic yogurt dip with grated cucumber and dill. It is a great topper for this salad. Mix marinade ingredients in a Ziploc bag. Add diced chicken to marinade in bag. Refrigerate 2-3 hours or overnight. Drain chicken in a colander; discard marinade. Preheat oven to 450°F. Line a baking sheet with foil. 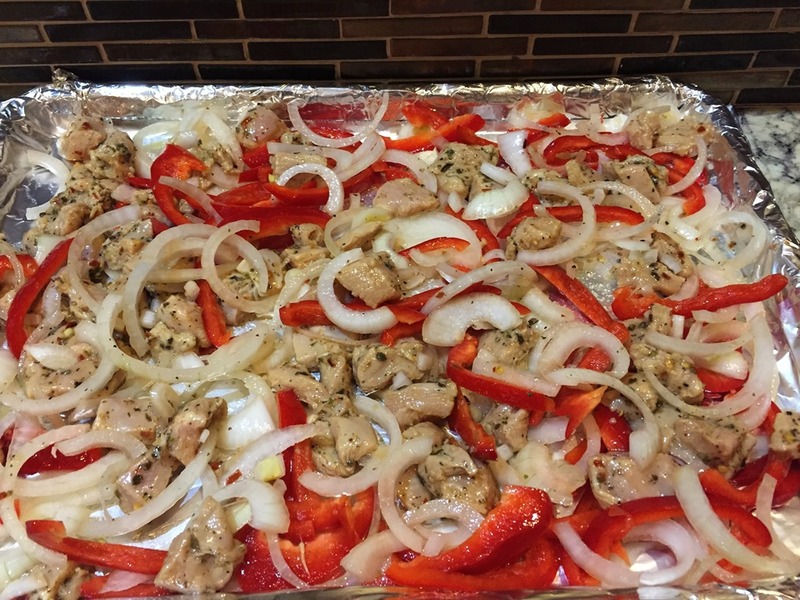 Place chicken and sliced onion and red pepper on the baking sheet. Roast for 15-20 minutes, or until chicken is cooked through and vegetables just begin to char. Broil for 1-2 minutes at the end of cooking time, if needed. To cook in a skillet: Sauté in large skillet for 5 minutes; drain any excess liquid. Continue to cook until chicken is cooked through and beginning to brown. Remove chicken from skillet and set aside. Heat 1 Tbs oil in skillet. Add peppers and onions to skillet; cook until tender. Return chicken to skillet and heat through. 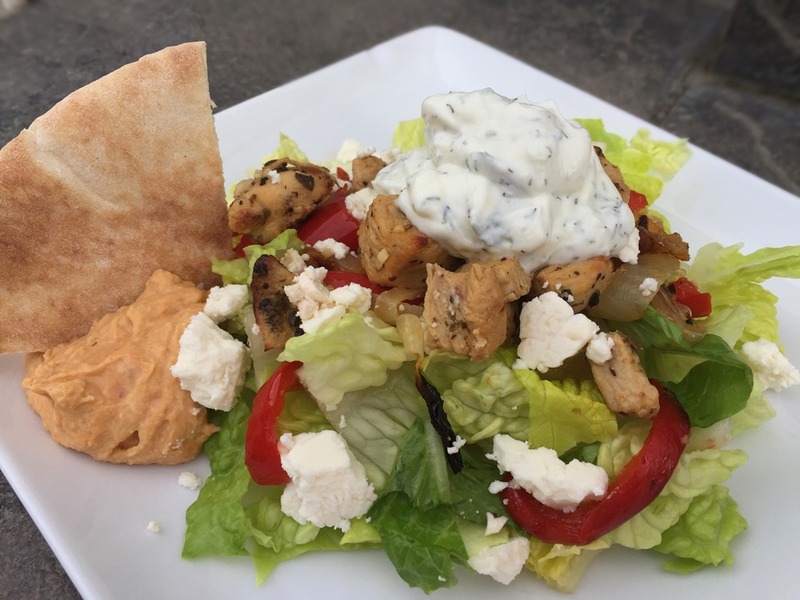 Serve over lettuce with feta cheese, tzatziki, hummus and pita bread wedges. Chicken can also be eaten inside of pitas with hummus, tzatziki and feta cheese. Grate cucumber (unpeeled), sprinkle with salt and drain in a colander until most of the liquid leeches out. Pat dry with a paper towel. Combine yogurt and cucumber with remaining ingredients. Add additional salt (about ¼-½ tsp) to taste. Refrigerate several hours to blend flavors. If you have a baking stone, place it (ungreased) in the oven while preheating (if you are using a regular baking sheet, place in oven only 1 min before adding bread). Preheat oven to 475°F for at least 15-20 minutes. Combine all ingredients in a mixing bowl. Mix well and then knead until smooth and elastic, adding additional flour if needed until dough doesn’t stick to the sides of the bowl. Let dough rest for 10 minutes. Divide dough into 12 small balls. Leave in covered bowl. Roll 1 or 2 dough balls into circles about 6-inches across and ¼-inch thick. Place on hot baking stone, one or two at a time. Cook 2 minutes, or until dough puffs up. Turn over and cook about 1 minute longer. Remove from baking stone with a spatula. Place on a plate and flatten pita slightly with spatula (don’t completely flatten, or insides will stick together). Cover with a towel while other pitas are cooking. Cut in half and fill to eat. Or cut into wedges and serve with hummus and/or tzatziki for dipping.